That's awesome man! We fished it in June as well. Funny enough... Bob was asking about you over the weekend. Ohio Fish-ins "Over 30lb Carp Challenge"
This Challenge will start at the Rayland Marina fish-in. 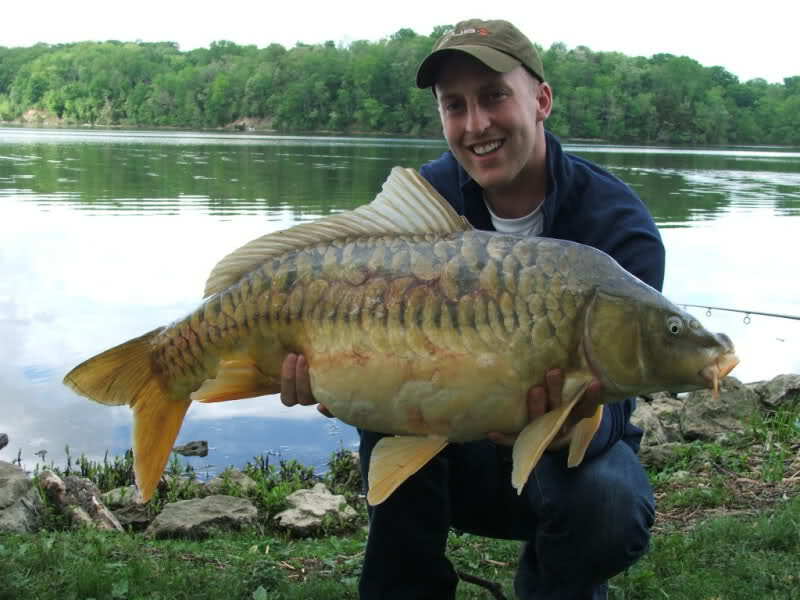 Description: Catch a Carp (Cyprinus carpio) over 30lbs during an Ohio fish-in to win the prize pot. Rules: Prize awarded to first Carp over 30lbs caught during the fish-in Open to all Ohio Residents OR those who have spent a majority of their life residing in Ohio. 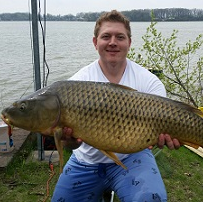 Carp must be caught during the specified time as defined on the Facebook event details. Must be caught on rod and reel. $5 per fish-in must be given to the State Chair or specified representative before your rods are in the water. Absolutely no exceptions. You are only eligible for the prize if you have entered during the current fish-in. Past entries during a fish-in do not automatically enter you into the prize during the current fish-in. If you are the first to arrive and the State Chair or representative is not present, you must send a picture to the State Chair of your 5 dollars with scenery of the fish-in shown in the background. Carp must be weighed and verified by another angler. A series of pictures must be taken; 1. Carp on the mat OR angler holding the fish, 2. Carp hanging from the scale in a sling showing the scale with weight. (Weight must be visible while the Carp is hanging. A video could be used as well). If no other angler is present, the fish must be sacked and verified once another angler arrives. Money will be held by the State Chair or specified representative. Money will be passed onto the next State Chair after resignation. Money total will be made public through Facebook after each fish-in. If no Carp over 30lbs is caught during the fish-in, the money will roll over to the next fish-in. If no Carp over 30lbs is caught during the last fish-in of the year, the money will roll over to next year’s first fish-in. We had a really great turnout this past weekend on the Huron River. The weather couldn't have been much better and the fishing was pretty good too. Over a dozen people came out and we even had a special visit from Bob Bernowski and the girls! Everyone got in the action whether it was Carp or Buffalo. The biggest Carp was just over 20 pounds and there were 4 or 5 Buffalo over the 20 pound mark as well. Lots of smaller fish were thrown into the mix so it turned into a numbers game to get something worth weighing. It was really good to see such a well attended event! Thanks to everyone who made it out! Our next fish-in is at Rayland Marina on October 19th-21st. See you on the bank! Date/Time 9/28 7am - 9/30 12pm Location: 30 Main St, Huron, OH 44839 Details: A 6 foot net handle can be used to net fish but something longer will make it easier. Releasing the fish with a sling and 2 dog leash clips attached to a rope is a good idea, but not absolutely necessary. I will have mine so anyone fishing around me is welcome to use. Many big fish have been caught at this venue. Countless 20's and even a couple over 30. Bring plenty of bait and when you think you have enough, bring more. There is enough room for about 12 people on the grassy area and if more come we can always overflow down the pier. If you do attend please allow 3 "spaces" between the next angler. You'll know what I mean when you arrive. If my calculations were correct it will allow 12 people. There is a Comfort Inn literally 30 seconds from the fishing location or a Motel 6 five minutes away. I've stayed in the Motel 6 twice and have had good experiences. The Motel 6 also has many fast food restaurants around. Staying in a bivvy is at your own risk. Had a great time at Cowan this weekend. Loads of fish were caught during the night bite with an occasional take during the day. Average size was probably around 15lbs with the biggest being 24+ caught by John Mayer. I believe there were 6+ 20's caught between all of us and a couple bruiser size Channel Cats. (It was definitely the biggest Channel I've ever caught.) The weather was pretty good almost all weekend even with the little bit of rain we got on Saturday morning. We didn't go hungry during this fish-in. Burgers, sausages, hot dogs, pasta salad, chips, cookies, etc etc kept us going all day and into the night. Thanks to everyone who made it out this weekend. Cowan has fished VERY well this year and I'd definitely like to see it on the 2019 schedule. The next fish-in is on the Huron River at Lake Erie on September 28th-30th. I expect a very sizable turnout this time around. Look forward to seeing everyone then! Venue: Jackson City Reservoir (Hammertown Lake) Date/Time: Aug 17 at 7 AM to Aug 19 at 12 PM Directions: https://www.google.com/maps/dir//39.051188,-82.68411/@39.0518567,-82.6868307,1048m/data=!3m1!1e3 We had a break in July but now it's time to get back on the bank. Hammertown Lake is a new venue for CAG Ohio so I hope to have a good turnout. Bobby Oney is fairly experienced on this lake and has caught fish just shy of 20lbs. If we get a number of anglers fishing for a weekend there is a good possibility to break that 20lb mark. No one has done an overnighter here, but I would imagine you can get by with an open face shelter. Be advised, there are no bathrooms. Plan accordingly I would be up for a Saturday cookout as well so we can decide on the specifics closer to the scheduled date Feel free to post up any questions and Bobby and I will do our best to answer. See you on the bank! Plenty of fish were caught over the weekend at Huron. I arrived on Friday morning at 7am, but cut my trip short on Saturday evening. Friday was pretty much exhausting for me as I never really got much time to sit down and relax. Between catching, baiting, and talking to people, I was wore out. I'd guess there were easily over 150 fish caught from Friday morning until Sunday at noon. It's one of those places where you can't put in enough bait. I even tried to be selective with the size of fish, but that didn't work. Big bait, big fish? Nope! I did a 5 stack of Trilogy King Korn and even the Buffalo wanted in on a piece of the action with their small mouths. I believe the biggest fish was caught by Kelly Mook at 23+lbs. As good as the fish-in was, I feel like this needs to be held in mid to late May before the spawn. If not in May then keep it during the Fall when the fish are starting to fatten up Thanks to everyone who came out and enjoyed the haulfest! Our next fish-in is August 17th-19th - Jackson City Reservoir (Hammertown Lake). Location: Huron River - Lake Erie Date/Time: 6/8/18 7am - 6/10/18 12pm Directions: https://goo.gl/maps/NPExxzrJCYU2 A 6 foot net handle can be used to net fish but something longer will make it easier. Releasing the fish with a sling and 2 dog leash clips attached to a rope is a good idea, but not absolutely necessary. I will have mine so anyone fishing around me is welcome to use. Many big fish have been caught at this venue. Countless 20's and even a couple over 30. Bring plenty of bait and when you think you have enough, bring more. There is enough room for about 12 people on the grassy area and if more come we can always overflow down the pier. If you do attend please allow 3 "spaces" between the next angler. You'll know what I mean when you arrive. If my calculations were correct it will allow 12 people. There is a Comfort Inn literally 30 seconds from the fishing location or a Motel 6 five minutes away. I've stayed in the Motel 6 twice and have had good experiences. The Motel 6 also has many fast food restaurants around. Staying in a bivvy is at your own risk as I don't know if it is allowed or not.